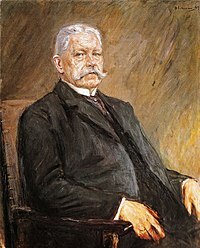 Paul Ludwig Hans Anton von Beneckendorff und von Hindenburg ( listen ), known generally as Paul von Hindenburg (German: [ˈpaʊl fɔn ˈhɪndn̩bʊʁk] ( listen); 2 October 1847 – 2 August 1934), was a Generalfeldmarschall (Field Marshal) and statesman who commanded the German military during the second half of World War I before later being elected President of the Weimar Republic in 1925. He played a key role in the Nazi "Seizure of Power" in January 1933 when, under pressure, he appointed Adolf Hitler chancellor of a "Government of National Concentration", even though the Nazis were a minority in cabinet and the Reichstag. Hindenburg retired from the army for the first time in 1911, but was recalled shortly after the outbreak of World War I in 1914. He first came to national attention at the age of 66 as the victor of the decisive Battle of Tannenberg in August 1914. Upon being named Germany's Chief of the General Staff in August 1916, his popularity among the German public increased exponentially to the point of giving rise to an enormous personality cult. 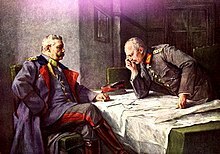 As Kaiser Wilhelm II increasingly delegated his power as Supreme Warlord to the German high command, Hindenburg and his deputy Erich Ludendorff ultimately formed a de facto military dictatorship that dominated German policymaking for the rest of the war. Hindenburg retired again in 1919, but returned to public life in 1925 to be elected the second President of Germany. In 1932, Hindenburg was persuaded to run for re-election as German President, even though he was 84 years old and in poor health, because he was considered the only candidate who could defeat Hitler. Hindenburg was re-elected in a runoff. He was opposed to Hitler and was a major player in the increasing political instability in the Weimar Republic that ended with Hitler's rise to power. He dissolved the Reichstag twice in 1932 and finally, under pressure, agreed to appoint Hitler Chancellor of Germany in January 1933. 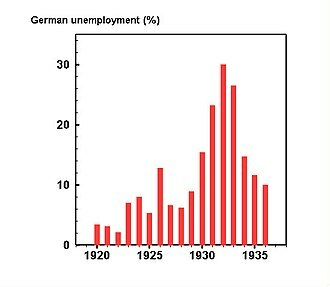 Hindenburg did this to satisfy Hitler's demands that he should play a part in the Weimar Government, since Hitler was the leader of the Nazi party which had won the largest plurality in the November 1932 elections (no party achieved a majority). In February, he signed off on the Reichstag Fire Decree, which suspended various civil liberties, and in March he signed the Enabling Act of 1933, which gave Hitler's regime arbitrary powers. Hindenburg died the following year, after which Hitler declared himself Führer und Reichskanzler, or Supreme Leader and Chancellor, which superseded both the President and Chancellor. Paul Ludwig Hans Anton von Beneckendorff und von Hindenburg was born in Posen, Prussia (Polish: Poznań; until 1793 and since 1919 part of Poland), the son of Prussian aristocrat Hans Robert Ludwig von Beneckendorff und von Hindenburg (1816–1902) and his wife Luise Schwickart (1825–1893), the daughter of medical doctor Karl Ludwig Schwickart and wife Julie Moennich. His paternal grandparents were Otto Ludwig Fady von Beneckendorff und von Hindenburg (1778–18 July 1855), through whom he was remotely descended from the illegitimate daughter of Count Heinrich VI of Waldeck, and his wife Eleonore von Brederfady (died 1863). 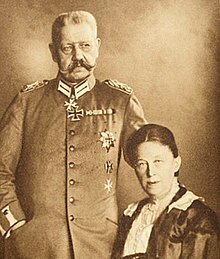 Hindenburg was also a direct descendant of Martin Luther and his wife Katharina von Bora, through their daughter Margareta Luther. Hindenburg's younger brothers and sister were Otto, born 24 August 1849, Ida, born 19 December 1851 and Bernhard, born 17 January 1859. One of his first-cousins was the great-grandmother of IKEA founder Ingvar Kamprad. His family were all Lutheran Protestants in the Evangelical Church of Prussia, which since 1817 included both Calvinist and Lutheran parishioners. Paul was proud of his family and could trace ancestors back to 1289. The dual surname was adopted in 1789 to secure an inheritance and appeared in formal documents, but in everyday life they were von Beneckendorffs. True to family tradition his father supported his family as an infantry officer, he retired as a major. In the summer they visited his grandfather at the Hindenburg estate of Neudeck in East Prussia. At age 11 Paul entered the Cadet Corps School at Wahlstatt (now Legnickie Pole, Poland). At 16 he was transferred to the School in Berlin, and at 18 he served as a page to the widow of King Frederick William IV of Prussia. Graduates entering the army were presented to King William I, who asked for their father's name and rank. He became a second lieutenant in the Third Regiment of Foot Guards. When the Austro-Prussian War of 1866 broke out Hindenburg wrote his parents: "I rejoice in this bright-coloured future. For the soldier war is the normal state of things…If I fall, it is the most honorable and beautiful death". During the decisive battle at Königgrätz he was briefly knocked unconscious by a bullet that pierced his helmet and creased the top of his skull. Quickly regaining his senses, he wrapped his head in a towel and resumed leading his detachment, winning a decoration. 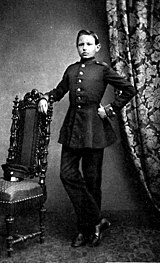 He was battalion adjutant when the Franco-Prussian War (1870–1871) broke out. After weeks of marching, the Guards attacked the village of Saint Privat (near Metz). Climbing a gentle slope, they came under heavy fire from the superior French rifles. After four hours the Prussian artillery came up to blast the French lines while the infantry, filled with the "holy lust of battle, " swept through the French lines. His regiment suffered 1096 casualties, and he became regimental adjutant. The Guards were spectators at the Battle of Sedan and for the following months sat in the siege lines surrounding Paris. He was his regiment's elected representative at the Palace of Versailles when the German Empire was proclaimed on 18 January 1871; he was an impressive figure: 195 cm (6 feet 5 inches) tall with a muscular frame and striking blue eyes. After the French surrender he watched from afar the suppression of the Paris Commune. He was transferred in 1885 to the General Staff and was promoted to major. His section was led by Count Alfred von Schlieffen, a noted student of encirclement battles like Cannae, whose famous Schlieffen Plan proposed to pocket the French Army. For five years Hindenburg also taught tactics at the Krieg-akademie. At the maneuvers of 1885 he met the future kaiser; they met again at the next year's war game in which Hindenburg commanded the “Russian army”. He learned the topography of the lakes and sand barrens of East Prussia during the annual Great General Staff's ride in 1888. The following year he moved to the War Ministry, to write the field service regulations on field-engineering and on the use of heavy artillery in field engagements — both were used during the First World War. He became a lieutenant-colonel in 1891 and two year later was promoted to colonel commanding an infantry regiment. He became chief of staff of the Eight Army Corps in 1896. He was given command of a division in 1897 as a major-general (equivalent to a British and US brigadier general) in 1897; in 1900 he was promoted to lieutenant general (major-general). Five years later he was made commander of the Fourth Army Corps based in Magdeburg as a General of the Infantry (lieutenant-general). (The German equivalent to four-star rank was Colonel-General). The annual maneuvers taught him how to maneuver a large force; in 1908 he defeated a corps commanded by the kaiser. In 1909 Schlieffen recommended him as Chief of the General Staff, but he lost out to Helmuth von Moltke. He retired in 1911 “to make way for younger men.” He had been in the army for 46 years, including 14 years in General Staff positions. When the war broke out, Hindenburg was retired in Hanover. On 22 August, out of the blue, he was selected by the War Cabinet and the German high command (Oberste Heeresleitung, OHL) to assume command of the German Eighth Army in East Prussia, with General Erich Ludendorff as his chief of staff. After the Eighth Army had been defeated by the Russian 1st Army at Gumbinnen, it had found itself in danger of encirclement as the Russian 2nd Army under General Alexander Samsonov advanced from the south towards the Vistula River. Momentarily panicked, Eighth Army commander Maximilian von Prittwitz notified OHL of his intent to withdraw his forces into Western Prussia. The Chief of the German General Staff, Generaloberst Helmuth von Moltke, responded by relieving Prittwitz and replacing him with Hindenburg. 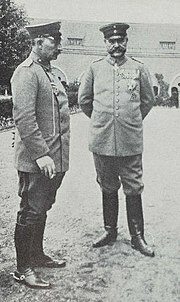 Upon arriving at Marienberg in 23 August, Hindenburg and Ludendorff were met by members of Eighth Army staff led by Lieutenant Colonel Max Hoffmann, an expert on the Russian army. Hoffman informed them of his plans to shift part of the 8th Army south to attack the exposed left flank of the advancing Russian Second Army. 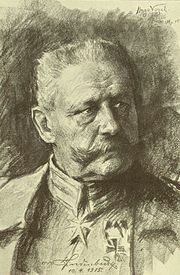 Agreeing with Hoffman's strategy, Hindenburg authorized Ludendorff to transfer most of the 8th Army south while leaving behind only two cavalry brigades to face the Russian First Army in the north. In Hindenburg's words, the line of soldiers that was defending Germany's border against the advancing Second Army were "thin, but not weak", because the men were defending their homes. If pushed too hard, he believed they would cede ground only gradually as German reinforcements continued to mass on the advancing Russians' flanks before ultimately encircling and annihilating them. On the eve of the ensuing battle, Hindenburg reportedly strolled close to the decaying walls of the fortress of the Knights of Prussia, recalling how the Knights of Prussia were defeated by the Slavs in 1410 at nearby Tannenberg. On the night of 25 August Hindenburg told his anxious staff, "Gentlemen, our preparations are so well in hand that we can sleep soundly tonight”. On the day of the battle, Hindenburg reportedly watched from a hilltop as his forces' weak center gradually gave ground until the sudden roar of German guns to his right heralded the surprise attack on the Russians' flanks. Ultimately, Russian losses amounted to the capture of 92,000 Russians and another 78,000 killed or wounded while German casualties numbered only 14,000. According to British Field Marshal Edmund Ironside it was the "greatest defeat suffered by any of the combatants during the war". Hindenburg realized that he would become a national hero and acted swiftly to fit that part, asking the Kaiser to name the victory the Battle of Tannenberg. On the east bank of the Vistula in Poland the Russians were mobilizing new armies which were shielded from attack by the river; once assembled they would cross the river to march west into German Silesia. To counter this threat, the supreme commander and Prussian War Minister Erich von Falkenhayn, who had superseded Moltke, formed a new Ninth Army, which joined Hindenburg's command. 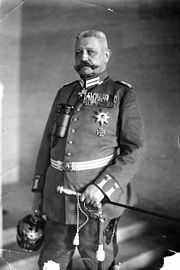 He set up headquarters at Posen in West Prussia, accompanied by Ludendorff and Hoffmann. Although his 16 divisions faced 60 Russian, he advanced into Poland to occupy the west bank of the Vistula. The Austro-Hungarians guarded the river shore on the German right flank. When the Russians attempted to cross the Vistula, the Germans held firm, but the Russians were able to cross in the Austro-Hungarian sector. Hindenburg retreated, destroying all railways and bridges, sure that the pursuing Russians must stop when they were 120 km (75 mi) west of their railheads — well short of the German frontier. The Russians celebrated a victory, but the retreat gained the Germans vital weeks. Hindenburg faced adversity with "God be with us, I can do no more!". On 1 November 1914 he was appointed Ober Ost (commander in the east) and was promoted to field marshal. Once the Russians repaired the railways they would be in position to push into Silesia, so Hindenburg re-positioned to strike their flank by moving Ninth Army by rail north to Thorn and reinforcing it with two corps from Eighth Army. On 11 November, in a raging snowstorm, they surprised the Russian flank in the fierce Battle of Łódź, which ended the immediate Russian threat to Silesia and also captured Poland's second largest city. Following his return, Ludendorff provided Hindenburg with a depressing evaluation of their allies’ army, which already had lost many of their professional officers and had been driven out of much of Galicia, their part of what once had been Poland. Meanwhile, the Russians were inexorably pushing from Galicia toward Hungary through the Carpathian passes. Under orders from Falkenhayn to contain the resurgent Russians, Hindenburg mounted an unsuccessful attack in Poland with his Ninth Army as well as an offensive by his newly formed Tenth Army which made only local gains. Following these setbacks, he set up temporary headquarters at Insterburg, and made plans to eliminate the Russians' remaining toehold in East Prussia. 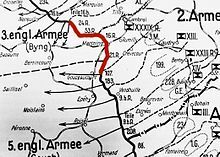 In the ensuing assault, the Germans would ensnare the Russians in a pincer movement between the Tenth Army in the north and Eighth Army in the south between his Tenth Army in the north and Eighth Army in the south. The attack was launched on 7 February, they encircled an entire corps and captured more than 100,000 men in the Second Battle of the Masurian Lakes, afterwards pulling back to strong defensible positions, against which still more Russians were sacrificed. Hindenburg judged their operations in 1915 as “unsatisfactory”, “The Russian bear had escaped our clutches” and abandoning the Polish salient had shortened their lines substantially. Contrariwise victorious Falkenhayn believed that “The Russian Army has been so weakened by the blows it has suffered that Russia need not be seriously considered a danger in the foreseeable future”. The Russians replaced their experienced supreme commander, Grand Duke Nicholas Nikolaevich, who Hindenburg regarded as skillful, with the amateurish Tsar. During 1915, 264,000 Germans were killed in the east, 169,000 in the west. The Austro-Hungarian emperor Franz Joseph died on 21 November. At the funeral Hindenburg met his successor Charles, who was frank about hoping to stop fighting. Hindenburg's Eastern Front ran south from the Baltic to the Black Sea through what now are the Baltic States, Ukraine, and Romania. In Italy, the line ran from the Swiss border on the west to the Adriatic east of Venice. The Macedonian front extended along the Greek border from the Adriatic to the Aegean. The line contested by the Russians and Ottomans between the Black and Caspian Sea ran along the heights of the Caucasus mountains. He urged the Ottomans to pull their men off the heights before winter, but they did not, he believed this was because of their "policy of massacre of the Armenians" and many froze. The front in Palestine ran from the Mediterranean to the southern end of the Dead Sea, and the defenders of Bagdad had a flank on the Tigris River. The Western Front ran southward from Belgium until near Laon, where it turned east to pass Verdun before again turning south to end at the Swiss Border. The remaining German enclaves in Africa were beyond his reach; an attempt to resupply them by dirigible failed. The Central Powers were surrounded and outnumbered. Strengthening their army would take time: by the second quarter of 1917 the field army would have 680,000 more men in 53 new divisions and the supply of the new light machine guns would be adequate. Field guns would have increased from 5,300 to 6,700 and heavies from 3,700 to 4,340. They tried to foster fighting spirit by 'patriotic instruction’ with lectures and films to “ensure that a fight is kept up against all agitators, croakers and weaklings”. Meanwhile, they were sure to be attacked before their buildup was complete. In the interim the pressure might be reduced if the Navy waged unrestricted submarine warfare, which they claimed would defeat the British in six months. The chancellor and his camp were opposed, not wanting to bring the United States and other neutrals into the war. After securing the Dutch and Danish borders, Hindenburg announced that unrestricted submarine warfare was imperative and Ludendorff added his shrill voice. On 9 January the chancellor bowed to their unsound military judgments: underrating the United States and overrating their own navy. The withdrawal became more fraught when the armistice obliged all German troops to leave Belgium, France and Alsace Lorraine in 14 days and to be behind the Rhine in 30 days. Stragglers would become prisoners. When the seven men from the executive committee of the soldiers' council formed at Spa arrived at OHL they were greeted politely by a lieutenant colonel, who acknowledged their leadership. When they broached the march home he took them to the map room, explaining allocation of roads, scheduling unit departures, billeting and feeding. They agreed that the existing staffs should make these arrangements. 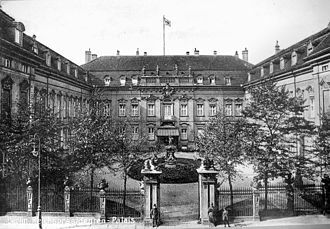 To oversee the withdrawals OHL transferred headquarters from Belgium to Kassel in Germany, unsure how their officers would be received by the revolutionaries. They were greeted by the chairman of the workers' and soldiers' council's who proclaimed that: "Hindenburg belongs to the German nation." His staff intended to billet him in the kaiser's palace there, Wilhelmshöhe. Hindenburg refused because they did not have the kaiser's permission, instead settling into a humble inn, thereby pleasing both his monarchist staff and the revolutionary masses. In the west 1.25 million men and 0.5 million horses were brought home in the time allotted. A brilliant display of the army's competence. Reichpräsident Ebert died on 28 February 1925 following an appendectomy. A new election had to be held within a month. None of the candidates attained the required majority, Ludendorff was last with a paltry 280,000 votes. By law there had to be another election. 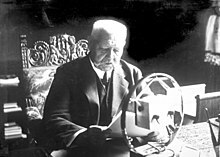 The Social Democrats, the Catholic Centre and other democratic parties united to support the Centre's Wilhelm Marx, who had twice served as chancellor and was now Minister President of Prussia. The Communists insisted on running their own candidate. The parties on the right established a committee to select their strongest candidate. After a week's indecision they decided on Hindenburg, despite his advanced age and fear, notably by Foreign Minister Stresemann, of unfavorable reactions by their former enemies. A delegation came to his home on 1 April. He stated his reservations but concluded "If you feel that my election is necessary for the sake of the Fatherland, I'll run in God's name." However some parties on the right still opposed him. Not willing to be humiliated like Ludendorff he drafted a telegram declining the nomination, but before it was sent Admiral Alfred von Tirpitz and a young leader of the East German agrarian nobility arrived in Hanover to persuade him to wait until the strength of his support was clearer. His conservative opponents gave way so he consented on 9 April. Again he obtained Wilhelm II's approval. His campaign stressed his devotion to "social justice, religious equality, genuine peace at home and abroad." "No war, no internal uprising, can emancipate our chained nation, which is, unfortunately, split by dissension." He addressed only one public meeting, held in Hanover, and gave one radio address on 11 April calling for a Volksgemeinschaft (national community) under his leadership. The second election, held on 26 April 1925, required only a plurality, which he obtained thanks to the support of the Bavarian People's Party (BVP), which had switched from Marx, and by the refusal of the Communists to withdraw their candidate Ernst Thälmann. In Britain and France the victory of the aged field marshal was accepted with equanimity. In foreign politicts he engaged in hostile policy towards Poland, often expressing hope that Polish state would disappear from map of Europe "at appropriate moment"
Hindenburg disliked Hitler, but he approved of his efforts to create the volksgemeinschaft, writing to his daughter on 17 February 1933 that he could feel the "Spirit of 1914" returning as "Patriotic revival very gratifying; may God preserve our unity!". For Hindenburg, the "Government of National Concentration" headed by Hitler was the fulfillment of what he had been seeking since 1914, the creation of the volksgemeinschaft. Despite the ensuing anti-red hysteria, the Nazis received only 43.9% of the vote, though with the support of the DNVP they had a majority in the Reichstag. During 1933 and 1934, Hitler was very aware of the fact that Hindenburg, as President and supreme commander of the armed forces, was now the only check on his power. With the passage of the Enabling Act and the banning of all parties other than the Nazis, Hindenburg's power to dismiss Hitler from office was effectively the only means by which he could be legally dismissed. 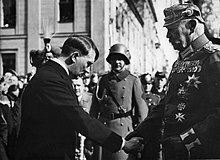 Given that Hindenburg was still a popular war hero and a revered figure in the Reichswehr, there was little doubt that the Reichswehr would side with Hindenburg if he ever decided to sack Hitler. Thus, as long as Hindenburg was alive, Hitler was always very careful to avoid offending him or the Army. Although Hindenburg was in increasingly bad health, the Nazis made sure that whenever Hindenburg did appear in public it was in Hitler's company. During these appearances, Hitler always made a point of showing him the utmost respect and deference. However, in private, Hitler continued to detest Hindenburg, and expressed his hope that "the old reactionary" would hurry up and die as soon as possible. Papen was furious, telling Hitler that he was acting as a "trustee" of Hindenburg, and that a "junior minister" like Goebbels had no right to silence him. He resigned and immediately notified Hindenburg about what happened. Hindenburg told Blomberg to give Hitler an ultimatum—unless Hitler took steps to end the growing tension in Germany and rein in the SA, he would dismiss Hitler, declare martial law and turn the government over to the army. Not long afterward, Hitler carried out the Night of the Long Knives, for which he received the personal thanks of Hindenburg in a telegram. However, during the Nuremberg Trials Hermann Goring admitted the telegram was never seen by Hindenburg, and was actually written by the Nazis. Two hours after Hindenburg's death, it was announced that as a result of this law, Hitler was now both Germany's head of state and head of government, thereby cementing his status as the absolute dictator of Germany. 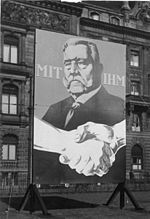 Publicly, Hitler announced that the presidency was "inseparably united" with Hindenburg, and it would not be appropriate for the title to ever be used again. In taking over the president's powers for himself without calling for a new election, Hitler technically violated the Enabling Act. While the Enabling Act allowed Hitler to pass laws that contravened the Weimar Constitution, it specifically forbade him from interfering with the powers of the president. Moreover, the Weimar Constitution had been amended in 1932 to make the president of the High Court of Justice, not the chancellor, acting president pending a new election. However, Hitler had become law unto himself by this time, and no one dared object. 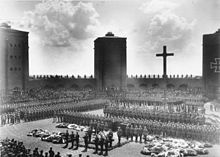 Contrary to Hindenburg's will, he was interred with his wife in a magnificent ceremony at the Tannenberg Memorial. In 1944 as the Russians approached Generalleutnant Oskar von Hindenburg moved his parents' remains to western Germany. After World War II the Poles razed the Tannenberg Memorial to the ground. What's the good word on Paul von Hindenburg?